The 2017 Winter Camp is Saturday December 2. The program will begin at 9.30am and run until 11am. The clinic is free for boys and girls aged 5 to 15. There will be fun games and activities to teach the skills and rules of the great game of Australian football. The kids session will be followed by a coed non-contact game for adults! Parents welcome. Pictured Coach Chris and CJ at the 2010 SMF Winter Camp. The 2017 AGM will take place at Noon. 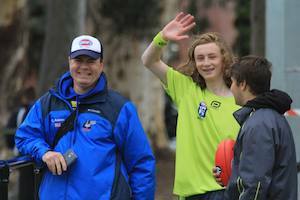 In August, the international footy world descended on Melbourne for the 2017 AFL International Cup. This two-week tournament includes the best amateur Australian football teams through-out the world. The USA sent 4 teams to Melbourne, the USA Revolution men's team, the USA Freedom women's A team, the USA Liberty women's B team and the USAFL Umpires. 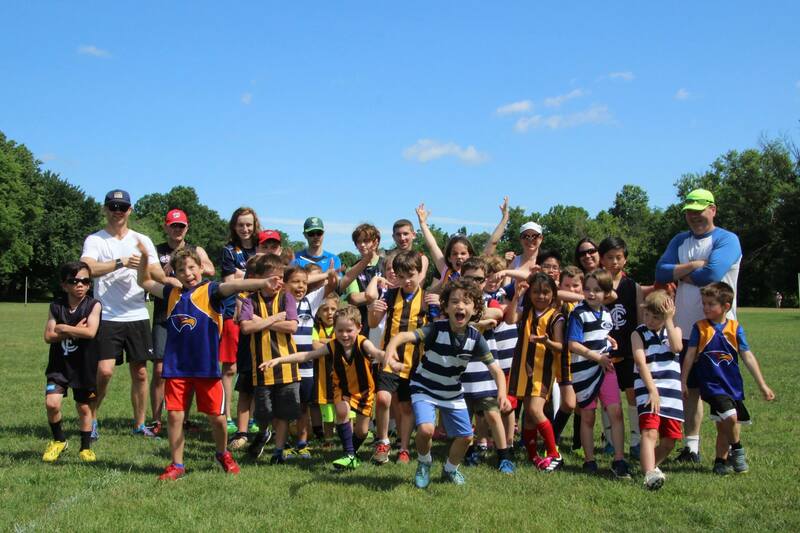 Saturday Morning Footy was very well represented. Coach Jay Levesque played for the Revos, coach Karen Stablein played for the Liberty and Freedom. On the umpire side, Coaches Chris and CJ Adams worked as field and boundary umpires in the tournament. Coach Sid Caeser worked as a goal umpire. Unfortunately, we have to cancel our session on July 15. We will be back for the final session and Hot Dog Sizzle on July 22. As America celebrates its birthday, Saturday Morning Footy will take a break. Hope everyone has a fun and safe holiday. We will be back with SPECKY WEEK on July 8. In August, the USA Revolution men's team and the USA Freedom women's team head to Melbourne to compete in the 2017 International Cup. You can help support the programs here and here.